So on to the reason for today's post. 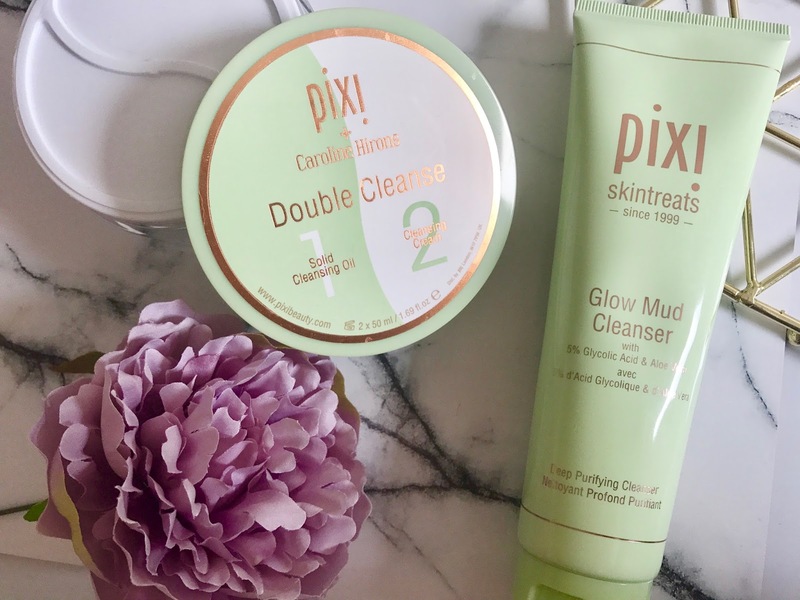 Pixi by Petra is the beauty brand that revels in their cult following. With high profile and well respected ambassadors like Caroline Hirons putting their names to the products the public are lapping them up off the shelves and stores are clambering to get them on to their shelves! 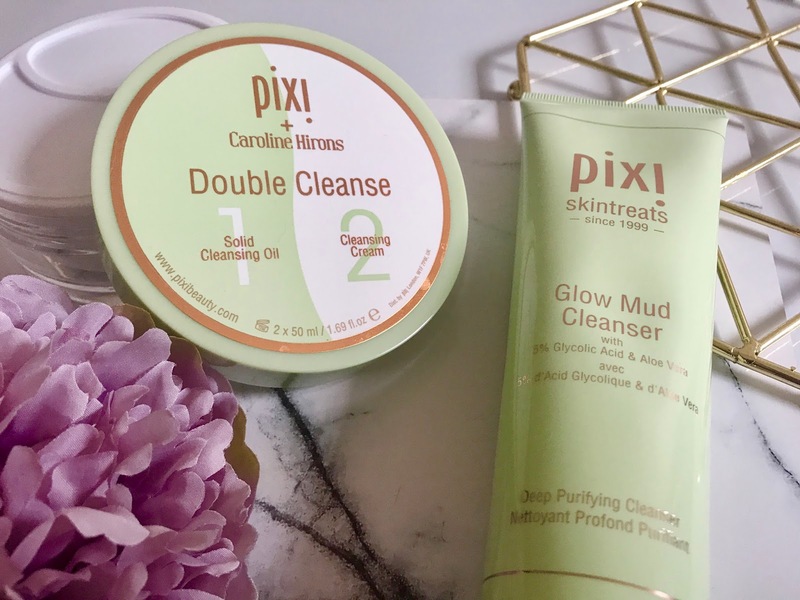 Previously in Belfast we were only able to get a limited range in Marks and Spencer's but now they have opened a full counter in House Of Fraser and I was finally able to get my mits on the famed Caroline Hiron's Double Cleanse and the Pixi Glow Mud Cleanser. Yes I could've bought these online but I've said it before and I'll say it again, I like to buy things for the first time in person. I like to feel the product and try it before handing over my hard earned money. These products aren't the cheapest so I want to know what I'm getting in to. We'll start with the Double Cleanse. Whereas their Nourishing Cleansing Balm is mainly made up of Sweet Almond Oil, Cocoa Butter and Shea Butter the solid portion of Double Cleanse is made up with Safflower, Avocado, Evening Primrose, and Olive oils. If you're not a fan of man made ingredients then you won't like the list of chemicals that make up the main bulk of the ingredients but they are the main emollient (softening) and cleansing elements of the cleanser so they really are important. 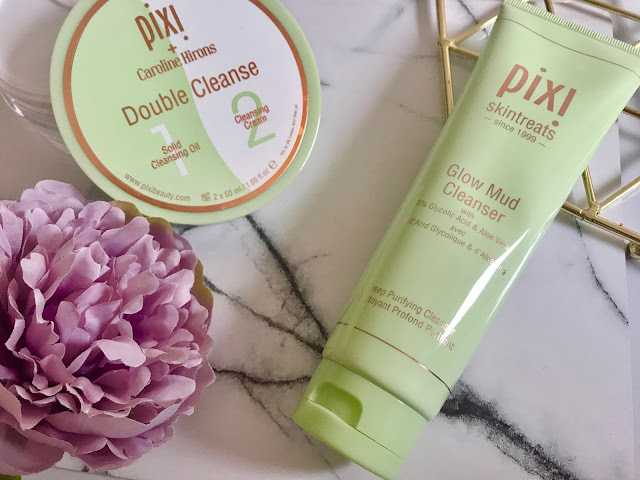 Double Cleanse Solid Cleansing Oil is ever so slightly softer textured than the Nourishing Balm which means you need a lot less and don't have to spend your time waiting for it to melt on your skin. It just works. Part two is the cleansing cream which, if you're ingredient focussed, contains very few immediately recognisable ingredients but again a quick google just shows that they are everything you want in a cleanser. Whilst the oil goes to breaking down the dirt and makeup off your skin, the cream goes to removing it and giving you that freshly washed feeling. This is the part that actually makes you feel clean. 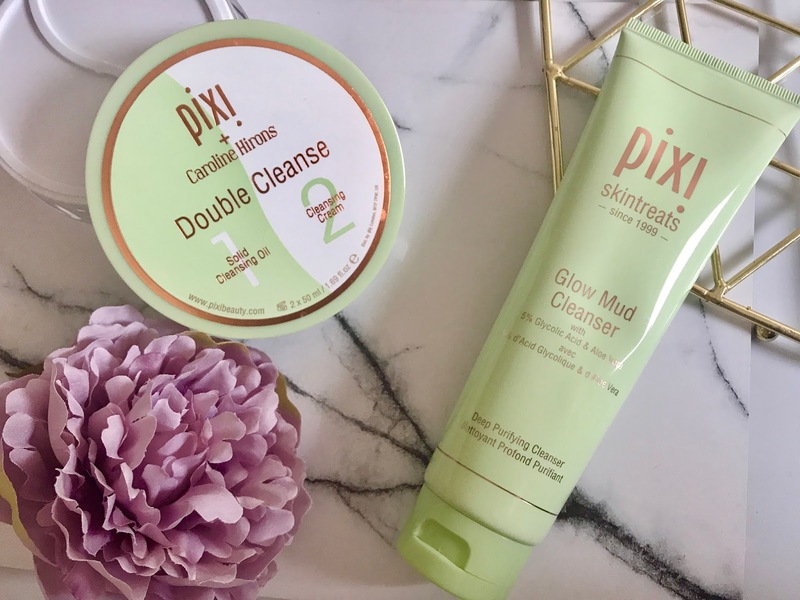 Verdict: Double Cleanse is a very good two step cleanser. Is it ground breaking or life changing? Probably not. It sounds strange but I'll be keeping this one for special occasions when my skin really needs it. It's pricey; with each part only containing 50ml I reckon this will last about 7 or 8 uses which at £24 per tub means a single washed face could cost me £3. Like I said... special occasions. Glow Mud Cleanser is a different beast. Containing Glycolic Acid this is meant to be paired with Pixi Glow Tonic in order clear away and exfoliate dead skin. It also uses Hyaluronic acid and a mix of aloe vera and glycerine to brighten and give shine to the skin. You get a tonne of product in the tube (135ml for £18) which means that you're not afraid to use in daily. When I was speaking to the girls at Pixi they recommended using it as a mask and spot treatment for particularly dry and broken skin. Whilst it doesn't have the same wallop that the likes of Glamglow has, it does give a much needed boost if you're prepping your skin for a night out and just happen to have a breakout. Verdict: I like Glow Mud but I'm also slightly ambivalent. Maybe it's the fact that my skin is being particularly troublesome at the minute and I chose to start this at the wrong time. Maybe it's just months of using mud based masks that are miraculous and when I get a just OK result I'm kind of like... meh. I don't think I'm being particularly fair to it, I'm in the middle of a fairly depressing (melodramatic much?) cystic breakout which just doesn't seem to be clearing thanks to my low health and effed up immune system. My skin that isn't broken out is gorgeous, glowy and nourished whilst using this. Unfortunately thats not the part that I'm looking at right now.